Dental Crowns and Bridges are custom-fitted tooth prosthetics. Usually, dentists use them to replace or restore damaged and missing teeth. Crowns save the function of a tooth effectively. They also help prevent tooth decay, to cover a cracked tooth, to cover an implant, or to cover anchor teeth that support a bridge. There’s a good reason that most dental offices offer crowns. They work well, also the dental health of many patients depends on them. Unfortunately, crowns require a long waiting time for many dentists. Making a perfect crown (for a unique tooth) takes some time, and also includes very precise, hard-to-do measurements. Most dentists send their specs into a lab to be made. Because of this, many patients wait for a month or longer, with a temporary crown, before they finally have their new one put in. Because of this, Paradigm uses the latest in dental technology to offer a solution. Unlike the typical 2-4 week wait needed for getting a crown, Paradigm Dental offers a complete crown in under 2 hours, saving you time and money. We use computer-aided design and manufacturing (CAD/CAM) technology to make a crown while you wait. We take a digital scan of your mouth using an intra-oral camera to create a 3D image of your teeth and gums. This process doesn’t take more than a few minutes. The computer then suggests the ideal dimensions of the crown you need. The dentist will send that information to a machine that will carve the tooth out of a ceramic block. Your new crown can then be bonded over your prepared tooth. It really is that easy! 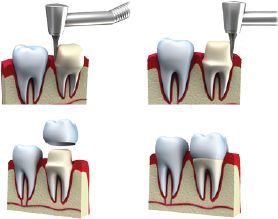 This process completely eliminates the need for impressions, a temporary crown, and multiple visits. Remember that every patient is different. A crown option that works for one person may be the wrong choice for another. It’s always a good idea to take the time to do your research and consult a dentist before making any significant changes to your teeth. So if you’re interested in a dental crown, take a few moments to make an appointment. Not sure what you need? We also offer free, no-pressure consultations to help you find the best option. Contact Us for more information.